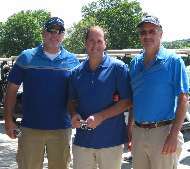 The weather provided a perfect backdrop for our Annual Golf Outing on July 22, 2015. 114 golfers and 21 golf clinic participants were joined by 16 additional people for appetizers, drinks, dinner and prizes after a gorgeous day on the course at Farmstead Golf and Country Club. 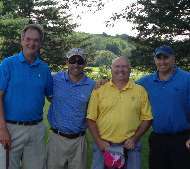 Low score went to the Foursome of: John Hughes from Privi Organics Ltd, Carl Wolfson from Intarome, JP Benveniste from Phoenix Aromas and Bob Daly from Ascent Aromatics, where they shot a 10 under par of 60 for the day. The Longest Drive for Women went to Caitlin McAndrews of Belwood Aromatics, and the Longest Drive for Men went to Austin Palumbo of Callahan Chemical. The Closest to the Pin for Women winner was Maureen Murphy of Berje Inc. and the Closest to the Pin for Men winner was Vince Camuto of Callahan Chemical. 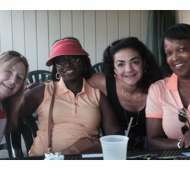 The WFFC wants to give a special thank you to the Golf Committee of Christine Varelas of Florachem/Allswell Chemical and June Burkhardt of JC Burkhardt Consulting LLC for their good humor and very hard work. We hope that you will join us on July 21, 2016 for the 22nd Annual Golf Outing and Clinic. 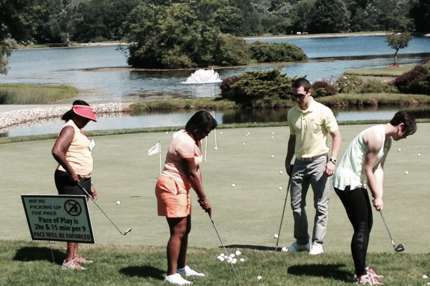 Golf clinic attendees learning to chip to the green.